Think any old pair of jeans are worth wearing? Think again! Our friends over at The Jean Shop made us rethink our denim game. Located at 37 Crosby Street in NYC, this awesome store is tucked away right behind Bloomingdales in SOHO. After walking into a sea of denim, you will feel how welcoming and helpful the entire crew is. The customer service is excellent and the walls are drenched with denim, providing an experience you will always remember. Owner Eric Goldstein gave us a tour of his shop and it speaks for itself. We met Eric at the Art of Denim Event, where he spoke about caring for denim with blogger Michael Williams. 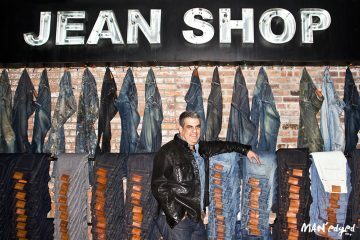 His experience in the denim game is massive, having worked personally with people like Ralph Lauren and Gap, overseeing their product development. We asked Eric what inspires him to get up every morning and he said creating great product for his customers is his main motivation. He aimed to create a product that is all about quality, customer service, and the experience. With 13 years in the industry and a quickly expanding business, Eric still enjoys being hands-on with his product and customer. The Jean Shop offers three types of silhouettes for their customers: the rocker, the straight, and slim fit. Each jean is made of salvage denim and has a vibrant pop of orange when you roll-up the jeans. If you are new to the Jean Shop, then get ready for a treat. You can feel the quality as soon as you pull up your pants. 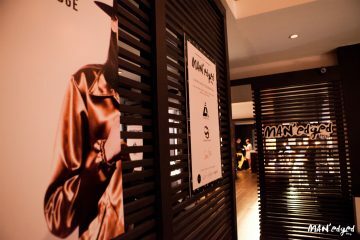 The Jean Shop product can be purchased at the brands free-standing store in SOHO and at various Club Monacos. You can also purchase from their online site here. Another favorite quirk about this store is that you can get custom jeans made! Feeling funky and want to make your jeans look like they’ve been worn for years? Well, you’re in luck! The Jean Shop can custom distress or dye your new jeans to your liking. Downstairs, the owner Eric and his crew make sure that his customers get exactly what they want. We got a behind the scenes look at the underground work area that is closed to the public. It’s pretty damn cool down there and the extra effort to customize your jeans is worth the price. Be sure to check out their old school Singer sewing machine in the photos below. The store creates custom leather items and repairs any of its own brand items. So, if you buy a Jean Shop piece from Club Monaco and need it repaired, you can head over to the shop or mail in your piece for some fixin’ up. We are absolutely in love with this brand and it’s down-to-earth vibe. From top to bottom, the brand does not disappoint! We thought we knew about denim, but have now realized the Jean Shop is the best in the business! Hit us up on Twitter or Instagram or better yet, drop a comment below and let’s get the conversation going.